Happy Monday! Can you tell my skin is a little bronzed? I started using these self-tanner face wipes to give my skin a little glow for fashion week and they are now a necessity in my beauty routine. In the winter when my skin is more dry, bronzer never seems to apply evenly to my face. Do you ladies ever have that issue? When I use these wipes, I don’t have to layer on the bronzer or worry about reapplying my makeup throughout the day. I swear by them! Another item that has been making multiple appearances in my outfits is this pair of five spike stud earrings by Pamela Love. Aren’t they insane?! Definitely a new favorite. A piece I kind of forgot about is my Louis Vuitton scarf. When I first bought it a few years ago, I planned to only wear it on special occasions (like as a wrap for weddings). When I rediscovered it hidden amongst other lost gems in my closet, I decided it’s time to get my money’s worth. Doesn’t it look pretty dressed down? The fabric is obviously high quality, so no matter how I wrap the scarf it falls perfectly into place. So glad I’m getting more use out of it! Your earrings are awesome and love that scarf. Love those earrings! I have been thinking about trying those tanner pads, I’ve never used self tanner so I’ve been nervous, but think I will check them out! The scarf looks great with this casual look. It’s always nice to find neglected pieces in our closets! Love this outfit! It’s perfect for cold weather and so chic! Gorgeous! Those earrings are killer and I love this easy mix of neutrals. Also, your hair looks gorgeous!! Love those earrings and this layered look! Those are the coolest glasses! I will definitely have to try those face wipes… I lack some serious glow in the winter months and I hate it! Cool, ive seen those self tanners, i dont necessarily need them but I want a shimmer that makes me look like ive been in st tropez. I absolutely loveeeee this look! How could you forget that scarf?!? Amazing!!! Me and my pale face will definitely have to check out those wipes! Love this neutral look, and how fun are those earrings?! Hope you’re having an amazing time at NYFW! Thank you for a lead on self-tanning wipes that look au natural! I never would have guessed, I would have thought bronzer! Can we talk about those shades? Love!! so in love with those earrings! that scarf!!! gorgeous. Love your boots, and bag too. Very chic look as always. The scarf looks great dressed out, you should wear it more. Those earrings are fab and your skin looks perfect so I may have to try those bronzer wipes because me and bronzer do not mix well in the winter! Love the scarf and the earring! major love for that bag and those glasses! That scarf just completely looks amazing with this outfit! Stunning! love those stack rings! Your closet looks like my absolute dream! I love, love, love this outfit! So classic and perfect! And how fun are those earrings – such a great addition to a classic look. Love it! Really Really wanting those SW boots, love them! You look amazing! I love those sunnies! This outfit is divine, loving the scarf. Will need to try out some of that bronzer! Those earrings are amazing!! And I LOVE that scarf! Love the earrings and the boots! Love your glow…keep wiping. ;-) And the scarf and shades are aaa-mazing! what a great outfit – I love the stacked rings! I am also definitely going to have to check out those face wipes — did you have any problems with streaking? I’m worried that I would never use them bc I would be too worried to mess it up and get horrible streaks across my face eek! loving the henry Bendel ring!! and the scarf of course! Oh my gossshhhhh. That bag!!!!!!! Looking veryyy chic, girly! And I LOVE those sunglasses in addition to the LV scarf. It’s been on my shopping list for quite a bit now =) Need to splurge! Hope you’ve had a great time in NYC. I am loving your layers and draping. Great neutrals too! I have been wanting those sunglasses! Now I want them even more! You make them look so amazing! love your super chic/classy style! Such a great neutral look. The bronze glow looks great on you Merritt! Love the total look….zeroing in on those fab sunnies & pretty smile! love this whole look… & now i want to try these tan towels for my face too. hope nyfw is/was glorious! So rocker chic! Love it! 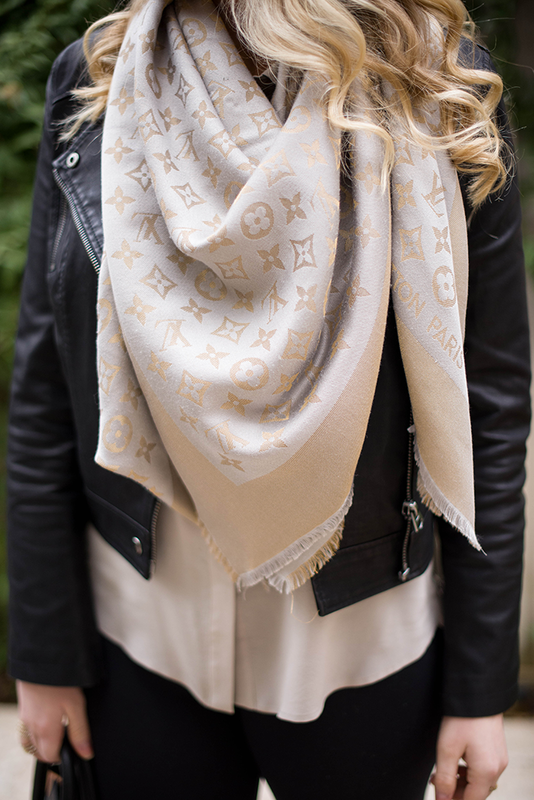 That LV scarf is gorgeous! !